Let's go back in time. Not too far back, mind you - - only around 40 or so years ago. We're here to make history FUN! Yeah - - that's generally the way most presentations and assemblies were like for me when I was in school. Even those about history. 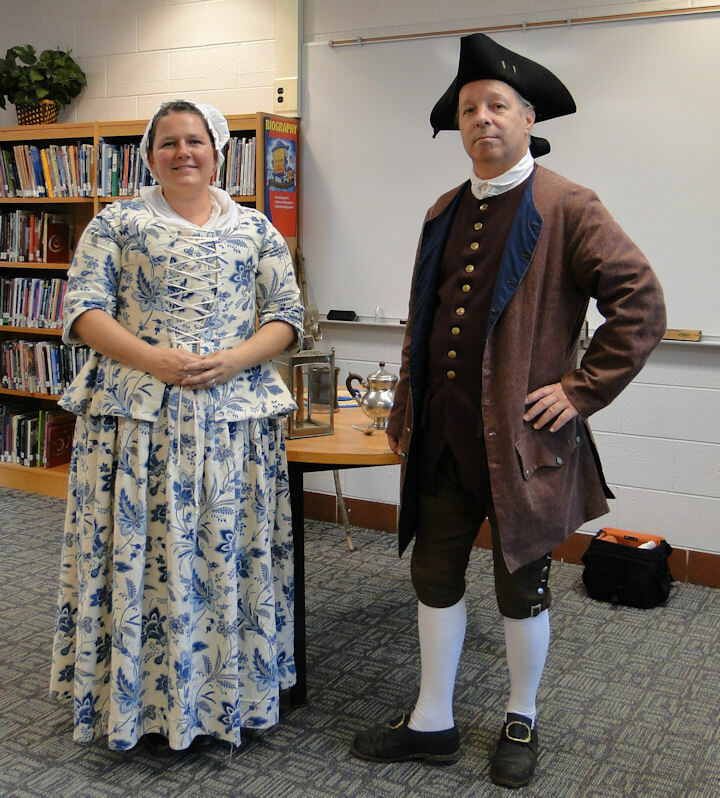 Well, now I do historical presentations for schools, and I do my best to make it anything but drab and boring! As you may know, I belong to a living history organization called "Our Own Snug Fireside," and I, along with Larissa (my partner in this venture) dress in accurate 18th & 19th century clothing, bring replica period-accessories, and try (to some level of success, I might add) to convey the excitement that history has to offer in our little expositions. The two of us have been presenting 19th century farm life for about a half decade now, and more recently, with the sestercentennial (250th anniversary) of the beginnings of the American Revolution at hand (remember the Stamp Act of 1765), we've added the Revolutionary War era to our repertoire. And do the kids respond favorably? Oh, there are those who will be perpetually bored. But it's usually because they don't want to be in school anyhow. And there are always those who think what we as living historians do is silly or stupid. Ahhh...that's okay, too. They have a right to their opinion. The majority, however, really seem to enjoy it. And, as a bonus, they learn something! 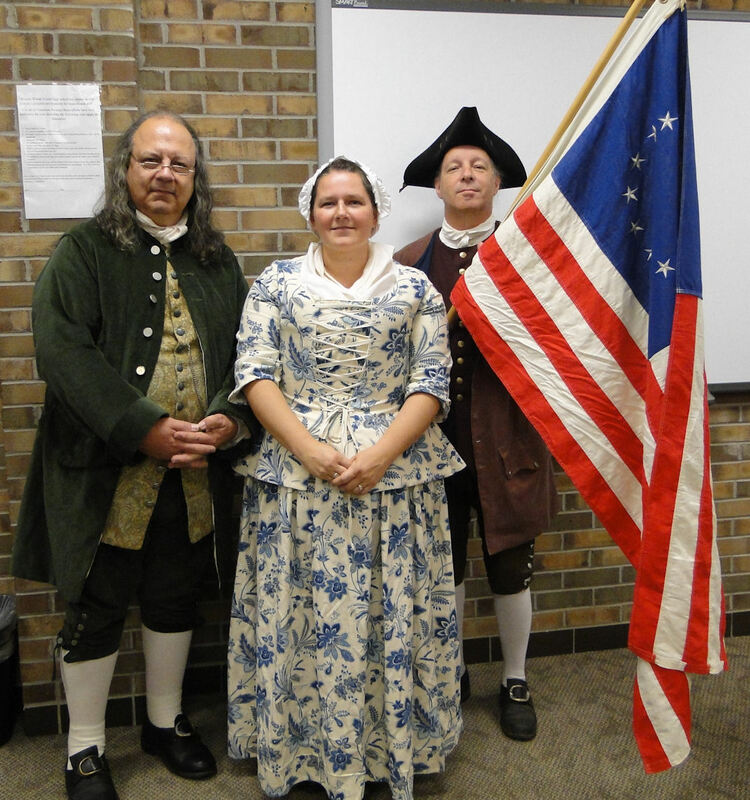 Ben Franklin, Sybil Ludington, and Paul Revere. Recently, Larissa and I did Revolutionary War presentations at two different schools within a few days of each other. The first one just happened to be at the school where I work, Warren Woods Tower High School. I can't tell you what an honor it was to present in front of the kids who I help each day. You see, I am a paraprofessional - a sort of teacher's aid. I help high school kids who have disabilities, usually physical, and I can't tell you how rewarding my job is. And then having the opportunity to do some living history in front of these same kids just brings it all home for me. 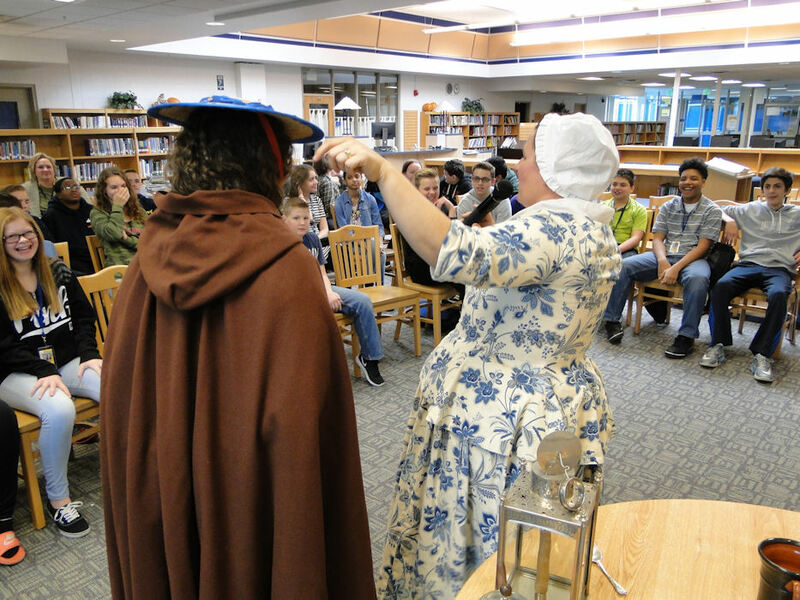 The second Revolutionary War presentation was for 8th graders at a local middle school - Carter Middle School - which we had been to before, and the kids, just as the first time, were excellent! The set up was a bit different but the delivery was pretty much the same (though Mr. Franklin was unable to participate in this one). 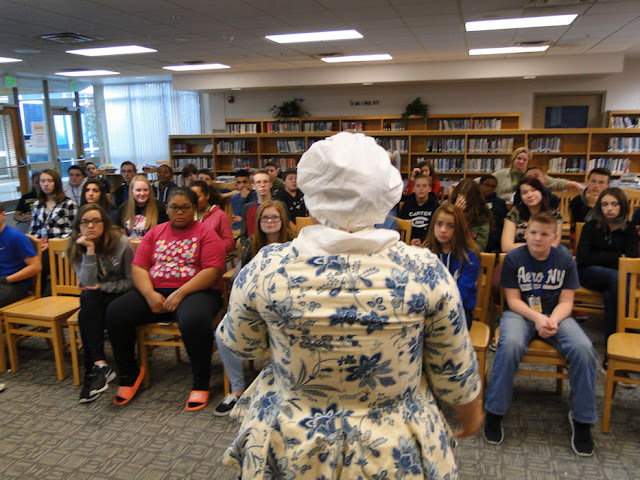 At both schools, the kids were attentive and had thoughtful queries about a variety of 18th century things including our period clothing, farm tools, and of our historic experiences. What really impressed me was their knowledge of the Stamp Act of 1765! Excellent! For our Rev War program we interpret the historic figures of Paul Revere and Sybil Ludington (known as the "female Paul Revere"). 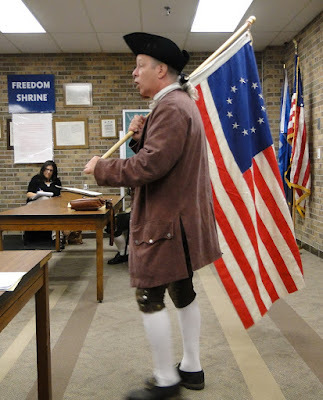 I had been studying Paul Revere pretty extensively over the last couple of years, and have interpreted as this man before, including at some of the reenactments I've participated in. And Larissa decided to take on and research Sybil Ludington to not only shine a light on a female patriot, but to also bring out little-known heroics of one of the 18th century women. Now, most of Paul Revere's life has been fairly well documented, but Miss Ludington's is a bit sketchy. There are some that say her story is a fabrication or maybe even a myth. I don't believe this; Larissa was able to find quite a bit on Sybil's life, as well as her not-so-famous ride. For our 1st Rev War presentation back in 2015, we plotted our course, worked out an outline, decided which accessories would be brought, and gave each other lots of encouragement, for neither of us had ever interpreted as a famous person in history before - at least, not to this extent. So successful, in fact, that we've kept our outline the same, for it works very well indeed. We begin our presentations with the teacher reciting excerpts from the infamous poem by Longfellow, "Paul Revere's Ride." Unfortunately, most people don't realize that this poem written in 1860 takes liberties on facts, including the mention of what happened when Paul Revere made it to Concord. Um...Revere never made it to Concord that night of April 18th - he got captured not too long after leaving Lexington and his borrowed horse was taken from him. He ended up making it back (on foot) to Lexington in time to witness the battle events. And that's the point where I, as Paul Revere, interrupt the teacher, and ask why are they reading such misinformation. The teacher responds with something along the lines of, "Well, Mr. Revere, why don't you tell us your story in your own words." And that was where I take over and give highlights of Revere's life: birth, occupation, 1st and 2nd marriage, children, and then go into some of the major events that helped him to make his mark in history, including his response to the Stamp Act, his joining of the Sons of Liberty, his sketch of the occurrences of the Boston Massacre, his involvement in the Boston Tea Party, his famous ride, and some known and some little known details about the evening of April 18th, including of his capture by the Regulars as he attempted to ride to Concord. In speaking about history, I feel it's so very important to hit the kids in such a way that they would understand it in their own terms. For instance, as I tell the story about the Boston Tea party, I asked the kids, "Who here likes Mountain Dew or soda pop in general?" Every hand went into the air. "And a bottle of pop costs about a buck fifty, correct?" "Well, I don't know if you heard but the King just put a tax onto your pop and it's now going to cost you double the price." Just as you would expect, the kids became a little upset at that thought. 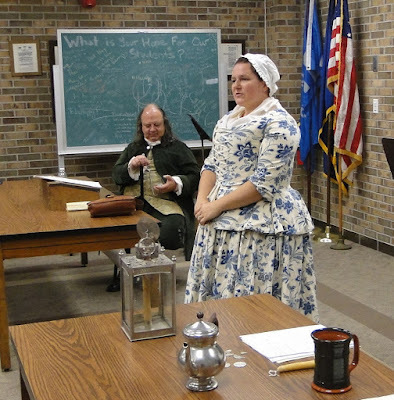 "Now, " I continued, "this is how we colonists felt about the tax on our tea and why we were so angry." They got it. 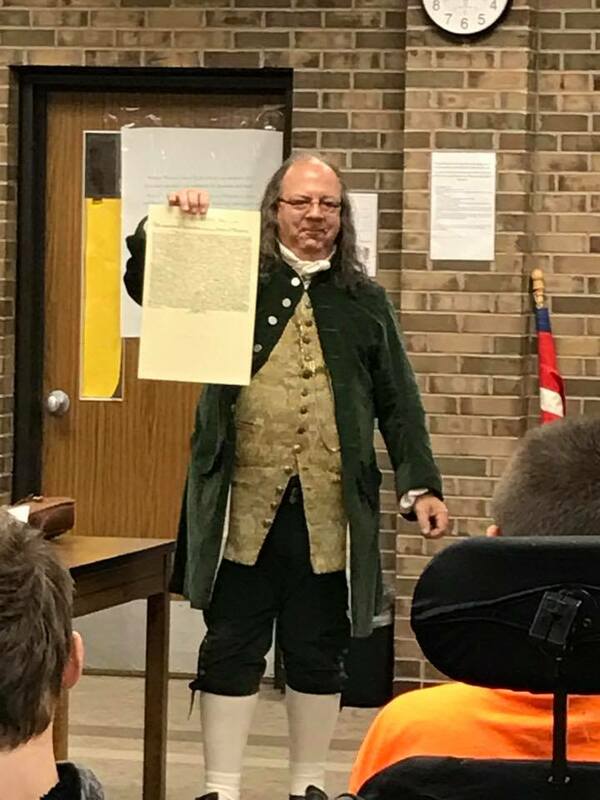 I will usually conclude my portion by giving a quick summary of the historic events that took place after my famous ride, including battles lost and won, the signing of the Declaration of Independence, Yorktown, and the formation of our Nation. I also mention all of the great men who were "my" (Revere's) contemporaries, such as George Washington, James Madison, Thomas Jefferson, Samuel Adams, Benjamin Franklin, John Hancock, John Adams, etc. And this is where Larissa, as Sybil Ludington, interrupts me to tell me it wasn't only men who made a difference and helped the patriotic cause, and then she proceeds to tell her tale of duty to country, and how on a stormy evening in 1777, this young 16 year old girl volunteered to warn the countryside of the attack from the British Regulars in Danbury, Connecticut. Larissa, as Sybil, tells how she rode 40 miles from her home to what is now the town of Kent, south to Mahopac, and north to Stormville, before returning home near dawn the next day, all the while avoiding British soldiers in the area, British loyalists, and "Skinners," who were outlaws with no allegiance to either side in the War. 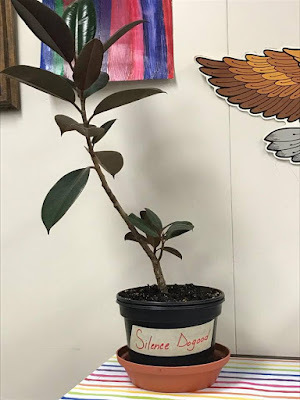 the kids in class got to sign it! It is quite a fascinating story that history seemed to have over-looked, and I like to think we're helping to bring it back to life. But that's not all we talk to the "scholars" about. We also speak to the kids a bit about every day life - what it was like to live "back then" - and of our period clothing we wore during this era in our history. Afterward they will usually ask us many questions, take 'selfies' with us, and are genuinely very full of thanks and appreciation for what we do. Our presentations usually last approximately one hour (depending), and all that time we hold the their interest, which is no easy task. By the way, for one of our presentations we had a very special guest: Dr. Benjamin Franklin, portrayed by living historian Bob Stark, joined us at one of the schools, to the delight of everyone involved. He gave the audience a general overview of his life, from being a chandler to working as an apprentice under his brother as a printer (including "Silence Dogood"), to his time in Europe, his adventures with electricity (including bringing "the key" to show the kids), and into his political stories. 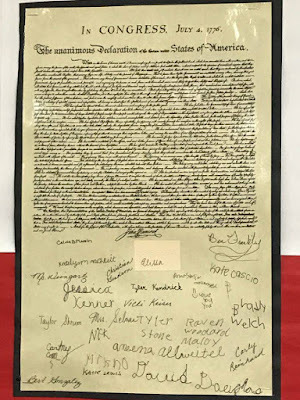 One of the things he did was speak about his part in writing the Declaration of Independence with four others, including Thomas Jefferson and John Adams. 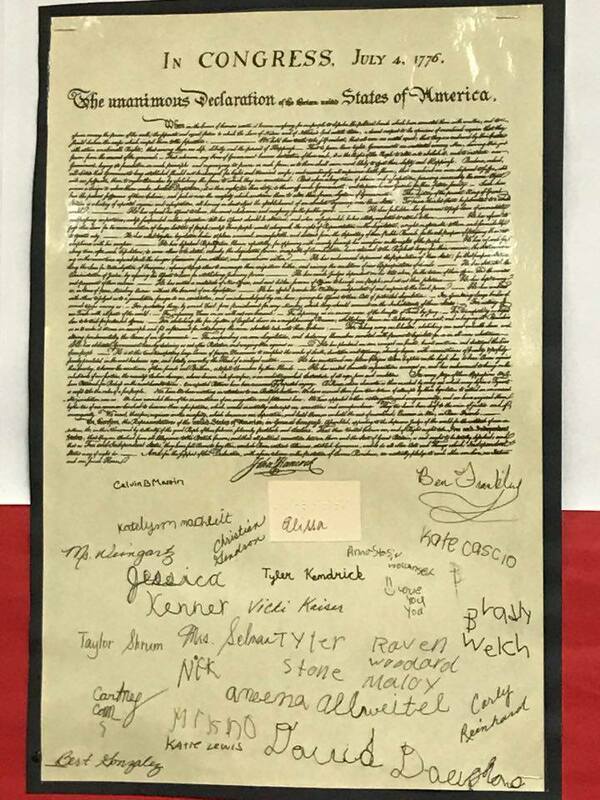 Our Dr. Franklin then recited this most important piece of American history. Well, at first it looked like he was reading it, but then he pulled the copy away and, as he finished his recitation, everyone was in awe as they realized he wasn't reading it, but he was delivering it by memory. This was a highlight, and one of the teachers mentioned that it brought her to tears. This was the first time we had Ben Franklin take part with us in our presenting. Guess who became the newest member of "Our Own Snug Fireside?" Yes! 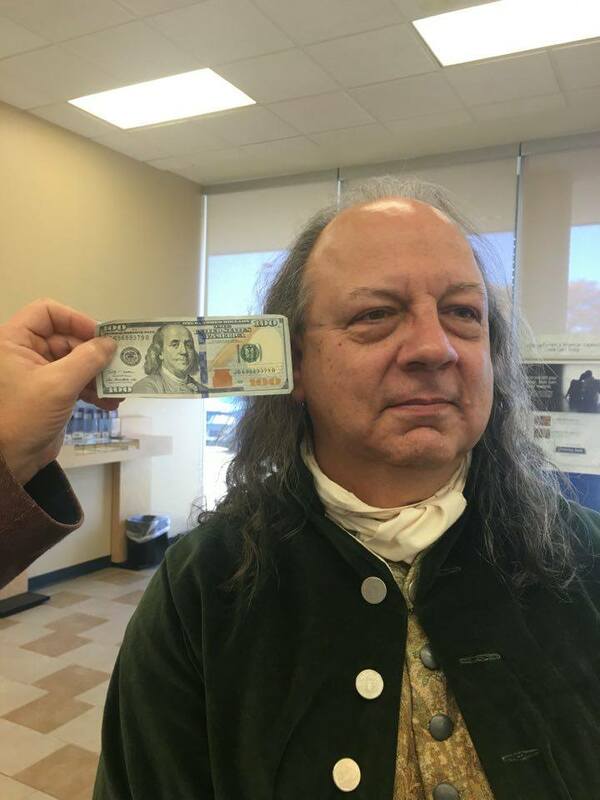 You are quite right if you said "Ben Franklin!" 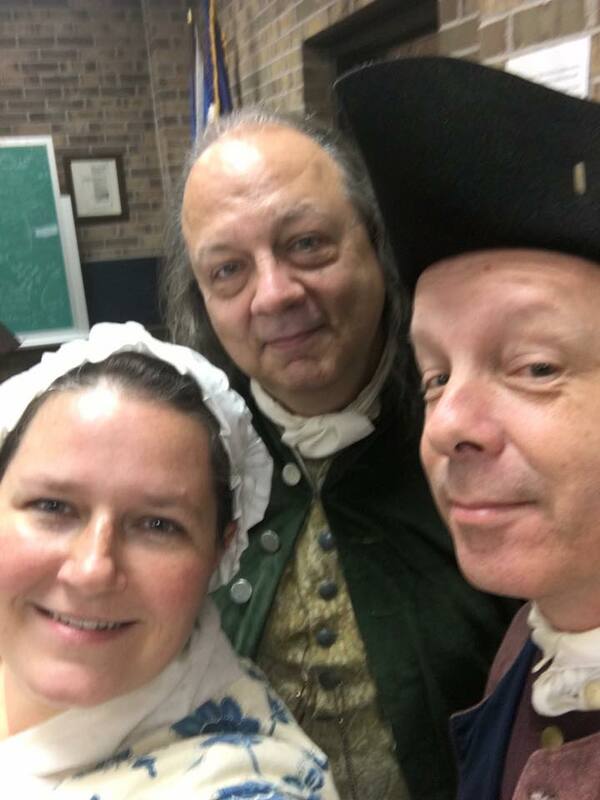 Larissa and I are very proud to have Bob Stark as Dr. Franklin join us in our group for our colonial productions. We are very particular about the quality of our programs and we both feel that Mr. Stark fits in not only because of his interpretation of Ben Franklin, but because our personalities all seem to click. We both feel his addition will bring our presentations to even higher historical levels - our wonderful group just got even better! Top notch quality for sure! Larissa, as Sybil Ludington, speaks to an attentive crowd - no small task when it comes to middle schoolers! A "lucky" young lady gets to try on some 1770s attire. We enjoy what we do, and the kids do, too! I am very happy and proud of the way that we present our Nation's history, and that we can direct it toward any age group, whether they are school age children or senior citizens or all the ages in between. And I gotta say it does help quite a bit that Larissa also works as a "costumed presenter" at the 1750 Daggett House at Greenfield Village, which gives her the first-hand experience of everyday life in the 18th century. And Bob Stark has been interpreting as Dr. Franklin for a dozen years, so he is not new to presenting in this manner. As for me, I've been a living historian for over a dozen years, and, like Larissa and Bob, I am constantly researching and reading of our great Nation's history in hopes of being as authentic and accurate as one can be. If we only had something like this when I was in school all those years ago...how cool that would have been! I think we have the pose we need for the bill. Mr. Hamilton will pay you your tuppence." On a side note: Sybil Ludington, Ben Franklin, and I (as Paul Revere) went out to eat at a nearby restaurant. Yes, in period clothing. It seemed like the entire place was staring at us, some out of the corners of their eyes, other blatantly. Of course, I'll be the first to admit, if I were a modern patron, I would have reacted the same way! Ben: "No, we're protesting against England!" Sybil: "We've come to take our country back---back to 1776!" What a hoot we had! As we left the bank and headed toward the restaurant parking lot, a woman driving by slowed her vehicle and rolled the window down stating, "You all look wonderful! Thank you for doing this!" I'm not quite sure what she thought we were doing, but we smiled and waived and thanked her. I love that you are sharing our history with school children. Many times they are given a watered down or even incorrect story our our founding fathers and the events that followed. Being raised in"Sybil Luddington" area just two things. Kent is north of Mahopac and south of Stormville. There is a lovely statue of Sybil alongside Lake Glenida in the town of Carmel, NY. This area rich with revolutionary war history, I hope you can make it here someday. Thanks for sharing your love of history with the younger generations. Black Friday? Bah! Time-Travel Friday!